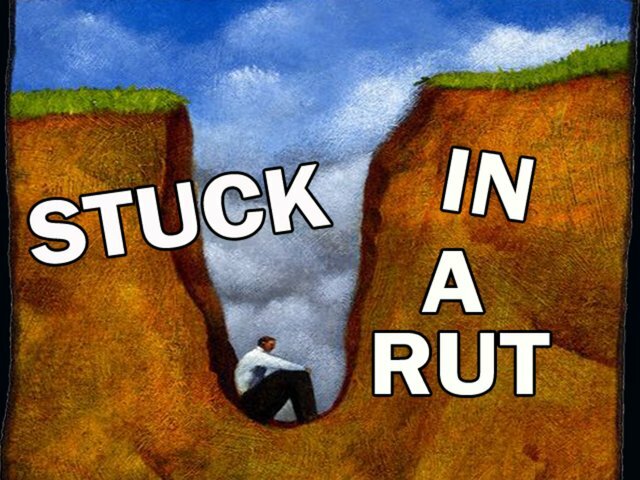 All of us get “stuck in a rut” at some point. What we do to get out is the important thing. Here are some suggestions.They’re not researched, or written in stone, or anything like that. They’re just guidelines, from me to you. 1. Change the way you normally workout. 2. When you drive home after work or school, try a different way. 3. Clean out your desk drawers, or your glove box in the car. 4. Wash your car yourself instead of taking it to the car wash.
5. Change up your food choices when you go grocery shopping. 6. Make a list of things you’d like to get done this week (just the act of making the list is uplifting itself). 7. Rearrange your work area. 8. Sleep on the other side of the bed. 9. Change the status picture on your Facebook page. 10. Make deadlines for things you want to get done (No. 6 part two). 11. Do at least one thing on the list right now. 12. Call a friend or relation whom you haven’t spoken to in a while. 13. Buy a different brand of shampoo. 14. Surf the internet, with the intention of finding new websites to explore. 15. Read a book you might not have even considered picking up in the past. 16. Ask the grocery clerk how his day is going. 18. Write yourself a letter about where you want to be in the next six months. 19. Go to that restaurant you’ve been wanting to try. 20. Change around the furniture in your apartment or house. Type As get all the attention. We love reading about Type A characteristics, we admire Type A people, and we really don’t know a whole lot about Type B people. There is no supreme personality trait. But when it comes to type A and type B, it is simply more acceptable to cop to being an A: a hard-charging go-getter who gets stuff done. The implication being that type Bs lack drive, ambition and ability, which is not the case. The B type personality is laid-back, but it is also patient, creative, collaborative, and even wise. So, without further adieu, here are 10 ways the lesser known personality type may be the best one after all. 1. You might be healthier. Type Bs are slow to anger and experience less chronic stress, which is associated with better outcomes for just about every health complaint, from asthma to depression to Type 2 diabetes and some cancers. 2. Everyone wants you on their project. Type B’s are creative thinkers, with a big-picture worldview, who are diligent and happy to share credit. 3. You’re a better friend. Type B personalities are often more poised in social situations: They are less competitive, more patient, more collaborative and happier to enjoy the moment — all infectious and pleasant behaviors to be around. 4. You take the long view. Bs are big picture thinkers. What they lack in detail-orientation, they make up for in a coherent view of the road ahead. 5. You do well with risk and failure. Type Bs are typically calm in the face of failure. Success is better, but a setback won’t send them reeling in quite the same way as it would a type A. 6. You see the good in people. One indication of a type B personality is the ability to see those around you for more than their usefulness to your purposes or a potential threat to your ascendency. 7. Creativity flows from you. Rather than the perception of laid-back people as not very smart, many type Bs lack urgency because their minds are elsewhere: creating interesting new products, solving complex problems and taking in the broader context. 8. You know how to enjoy the moment. The upside of being less hard-charging is that type Bs can enjoy each step on the path toward their goals. 9. You’re generally more satisfied with life. B types are more likely to feel satisfied with their lot in life, which isn’t just a happy way to be, it’s a healthy way too. 10. You put new people at ease. Your easy-going, outwardly-oriented ways don’t just put friends and colleagues at ease — they help you with new acquaintances and strangers as well, who can sense your generosity of spirit. You’ve heard talk of Type A and Type B personalities. The first part of this two-part blog series on stress is about the Type A personality. 1. They don’t procrastinate. They hate the idea of wasting time so they do things the moment they come to mind. Why wait and do it later when you can just do it now? 2. They always have a task list — a never-ending one. If there is another day to be lived, then there is another set of tasks to be accomplished. 3. They have several alarms set throughout the day so they always stay on top of things. They wish they could remember it all in order to save time, but this is the best next thing. 4. They have trouble understanding the stupidity of others. They don’t believe themselves to necessarily be exceptionally gifted or genius. So why is it that they are competent when almost everyone else seems like an idiot? 5. They don’t understand the concept of not being capable of doing something. To them, if something can physically be done, then why would they not be capable of doing it? If they need to learn something, they will. 6. They understand that laziness is a choice. Most people talk about laziness as if it was some sort of disease. Type A’s look at such people as idiots. Laziness isn’t more of a disease than is ignorance. 7. They often become passionate. If they are going to do something, then they are going to do something they believe to be meaningful. If it’s meaningful to them, then it deserves their fullest attention; passion is inevitable. 8. …But not always for too long. Unfortunately, because they are so passionate, and because true success takes patience, any sort of early failure easily discourages them. They are likely to pack up and change careers in a heartbeat. 9. They can be very emotional. Type A’s seem to be more strongly rooted in reality than most people. They seem to understand the world around them better, and because of this, they are more influenced by the outside world. Worse yet is that they are just as likely to be found lost in their thoughts — a very dangerous combination. 10. They’re prone to stressing. Put simply, they worry a lot. They do their best to see into the future and can’t shake the fact that things can always go wrong. Plus, being as passionate as they are makes them dread that ever possible and looming, crappy outcome. 11. Although they know they should take more time to relax, they don’t always find it appealing — and when they do, they simply can’t find the time. For them, they feel most at home working and doing their thing. It’s difficult for them to understand that getting away and slowing down is in their best interest. 12. They love sleeping, but have trouble stopping their thoughts from racing. It’s not easy to fall asleep when your mind just keeps on running through thoughts and images. Stopping them is no easy task. 14. They’re perfectionists. It’s not that they are trying to be perfect, but blemishes, mistakes and inconsistencies frustrate them. They find them ugly and appalling, not being able to allow them to pass their inspection. If they could, they would – but they simply can’t. 15. Doing things efficiently is their first priority. As little time spent getting as much quality work done as humanly possible? If you just got a hard-on, then you’re a Type A personality. 16. They make plans, lots of plans. If you want to achieve something, then Type A’s only find it logical that you should know how to get there. So they make plans. 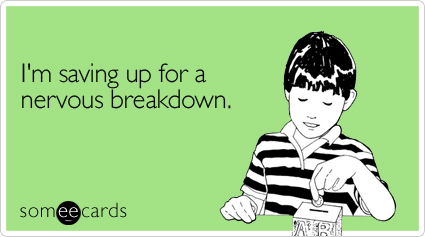 Unfortunately, making plans isn’t always efficient. Once they realize this, they revert to focusing less on planning and putting even more emphasis on efficiency. 17. They center their life on their careers. Their careers are their passion, their purpose in life. Once they figure out what that is, there isn’t much else that interests them. 18. More often than not, they feel that they are too busy to be in a relationship. This is sad, but true. Type A personalities often end up alone because they don’t allow themselves to date. They feel that they don’t have the time, so they don’t bother with trying to make a relationship work. 19. They have a tendency to cut others off in conversation — not to be rude, but to be right. I mean, what’s the point of letting them yammer on with some nonsense when you can just tell them the way it really is, and then you can both move on with your lives, right? 20. They love the spotlight. Some may call them attention-whores. 21. Always having a plan for the worst-case scenario is a necessity. What’s the worst possible thing that you can possibly imagine happening to you? You losing your job? Your pet Pooky getting run over by a car? Cancer? Armageddon? Yup, they have a plan for that. 22. They walk fast and with a purpose, doing all they can to avoid lines of any sort. To them, walking is getting from point A to point B in order to do what needs to be done at point B as soon as possible so that they can move on to point C. If you’re out for a leisurely walk, then find a park. 23. They are punctual and expect others to be the same. Other peoples’ time is worth respecting. The sooner you’re in, the sooner you’re out. That’s what she said. 24. Doing things with a purpose is the only way they know how to live. If there is not purpose behind action, then Type A personalities don’t see a reason for doing it in the first place. They understand that actions are only worth the goal they are trying to achieve. 25. They love solving problems and believe there is always a solution. They believe the world to work in a logical manner – minus the illogical creatures that live in it – and therefore, believe that there must always be a solution for every problem. For the very few that may not have a solution, they should be forgotten. Have a wonderful day. If you think of it, and if you pray, include me throughout the day. I had kind of a shock earlier this morning, and it’s making for a tough day. Thank you so much.